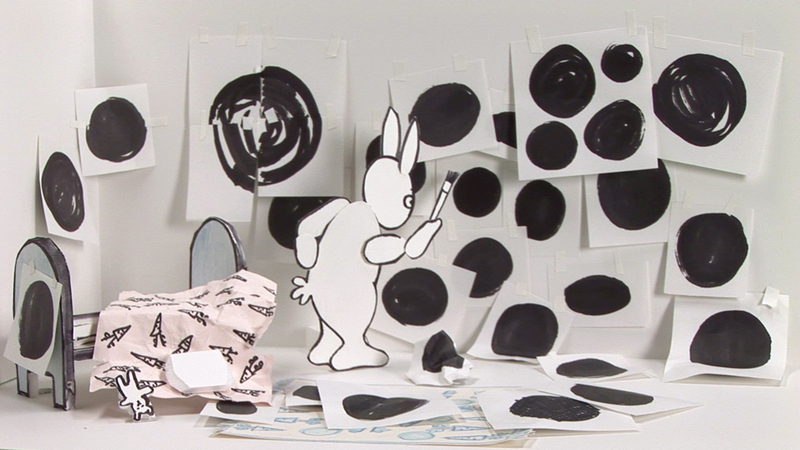 Jonathan Plante, Lapincyclope, still, 2013, animated video, 6 min 16 sec. Courtesy of the artist. 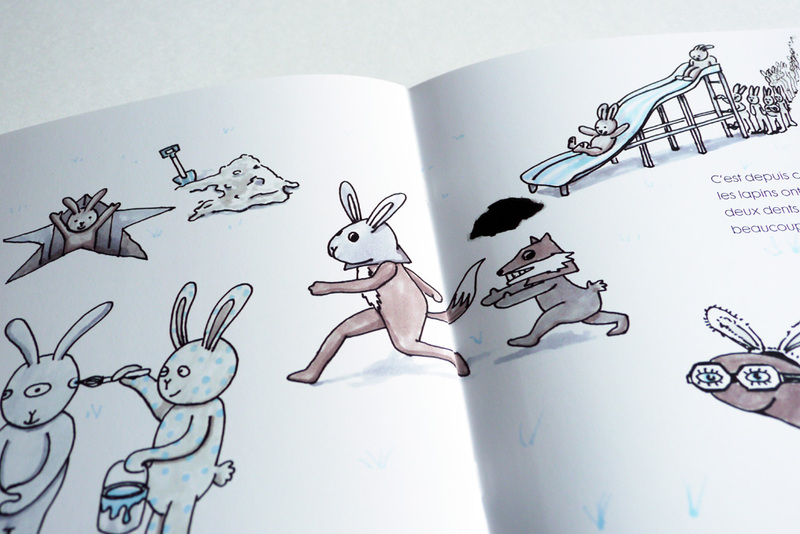 Jonathan Plante, Lapincyclope, 2013, illustration. Courtesy of the artist. 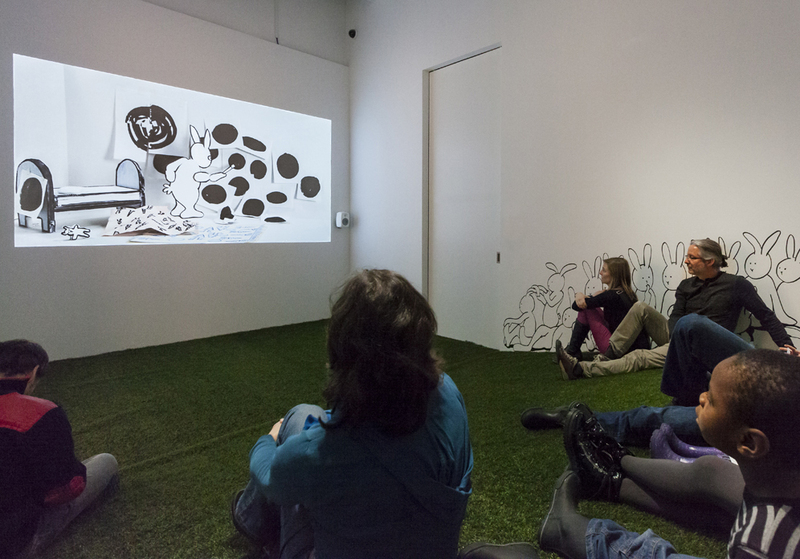 View of the exhibition Lapincyclope, VOX, from March 23 to May 4, 2013. 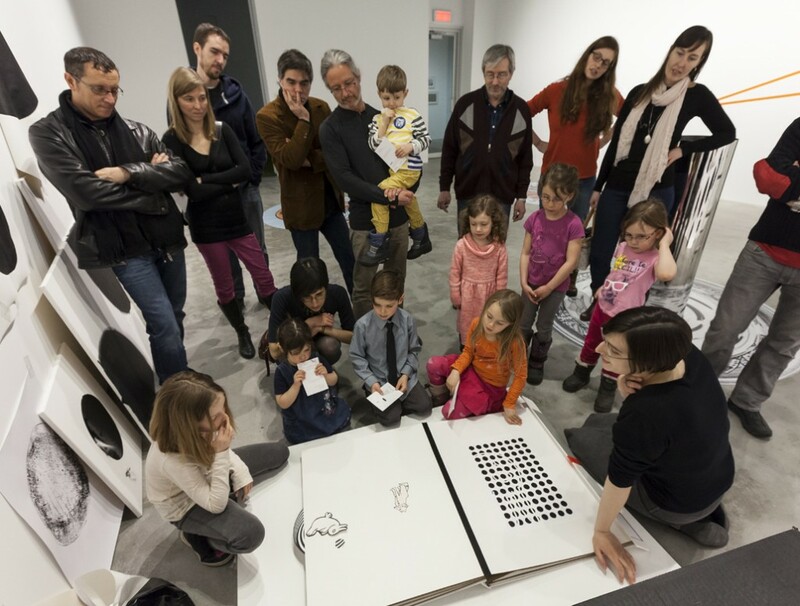 View of the exhibition Lapincyclope, Musée d’art de Joliette, from October 5, 2013 to January 5, 2014.
Credit: Musée d'art de Joliette. One-Eyed-Rabbit is different. 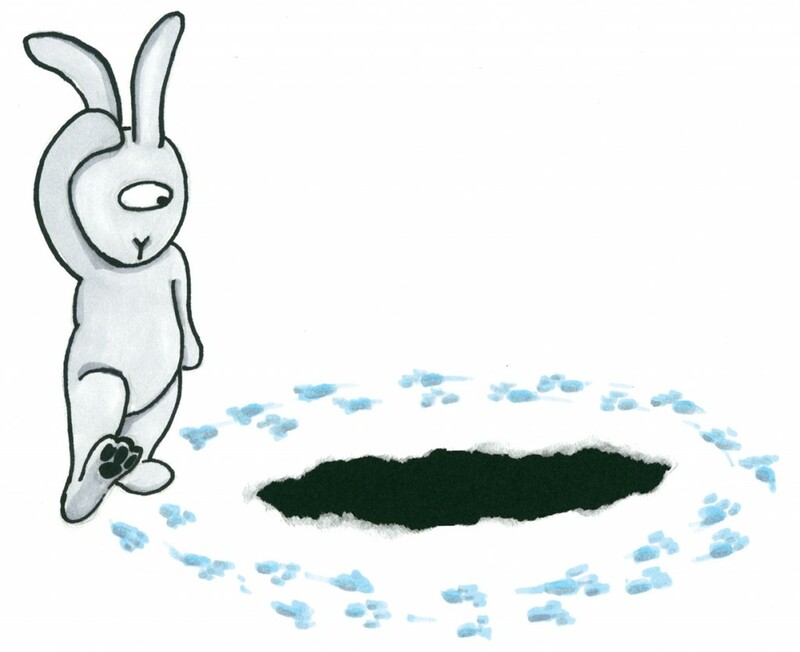 He has only one eye and would like to jump into his rabbit hole without chipping his teeth… He meets a worm that has no eyes but can navigate through holes in the ground! Together they will discover the power of imagination and the inner workings of sight: a little with the eyes, a lot with the brain, always with the heart. 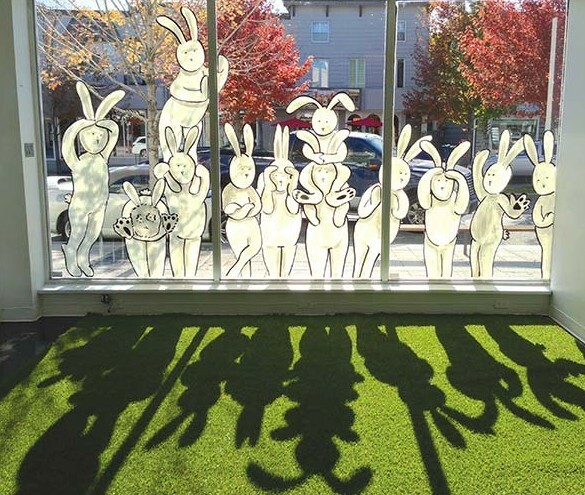 In a playful atmosphere and through the story of a friendly rabbit, Jonathan Plante invites young people aged 4 to 10 to (re)discover the mysteries of visual perception in a variety of ways. 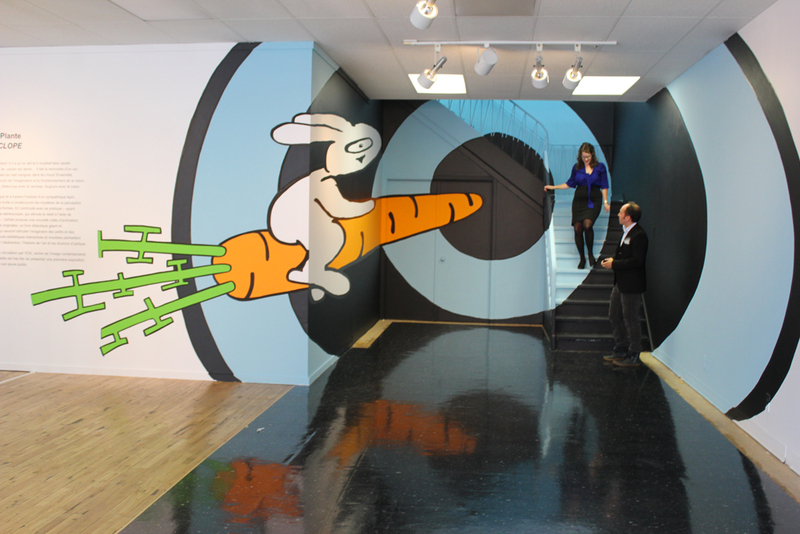 The artist is offering an animated video, original paintings, a giant didactic book, and mirror anamorphoses that will stimulate the imagination of little ones and grown-ups alike. 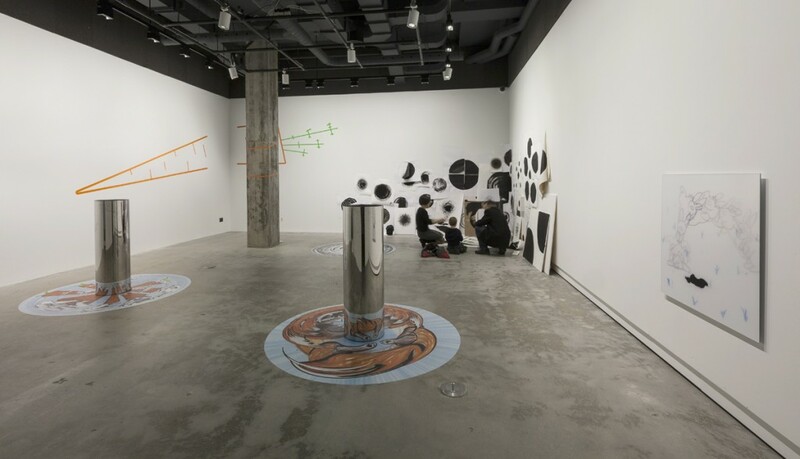 These unexpected and interactive aesthetic experiences notably address abstraction, art history and optical illusions. Through the various works, children are invited to discover the mechanisms of vision and the role it plays in the arts, while developping their imagination. 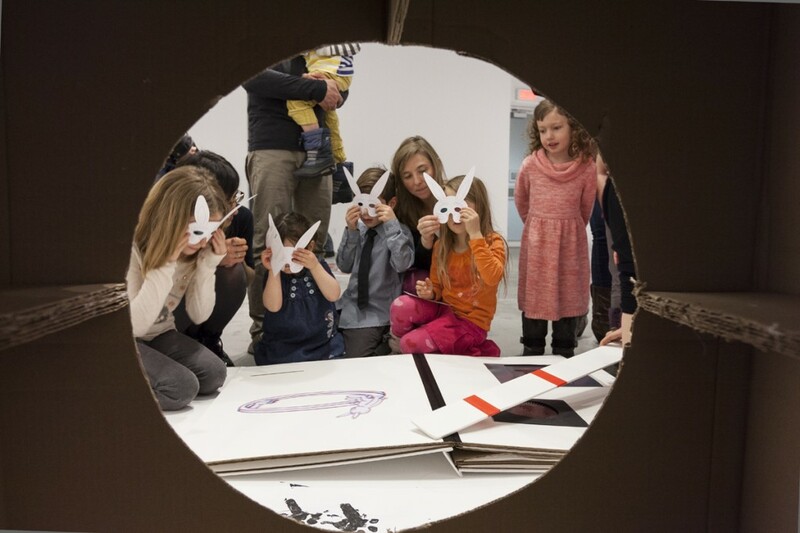 Finally, a children’s book based on the exhibition will allow readers to revisit the story of the One-Eyed-Rabbit for years to come (in French only). 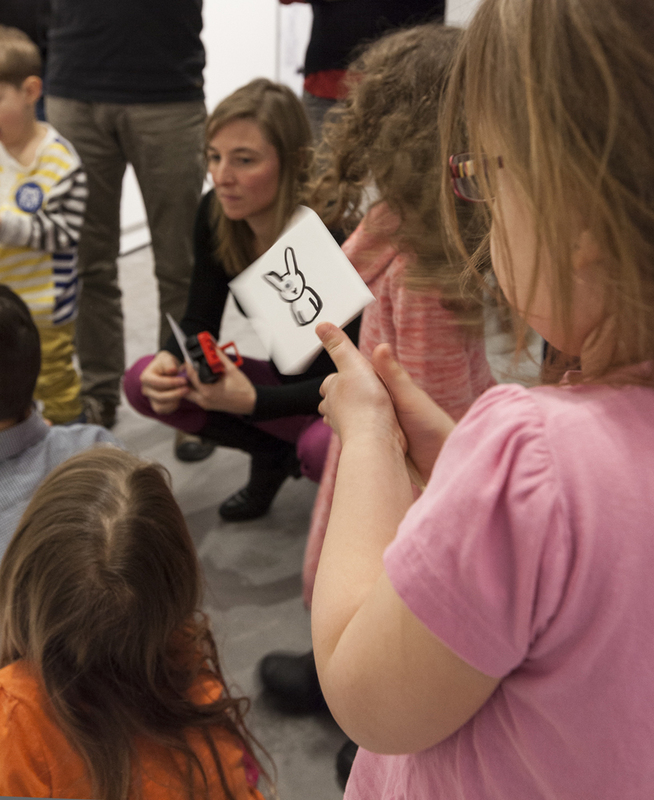 Created in collaboration with Les éditions du passage, this children’s book is an extension of the exhibition by Jonathan Plante presented at VOX from March 23 to May 4, 2013. Jérôme Delgado, “Les trous noir de l’imagination,” Le Devoir, April 6, 2013, E6. Aurore Elehmann, “De l’art et du lapin,” La Marelle, Mrach 29, 2013. Paule Macreuse, “Interview avec Jonathan Plante,” Punctum arts visuels, May 2, 2013. 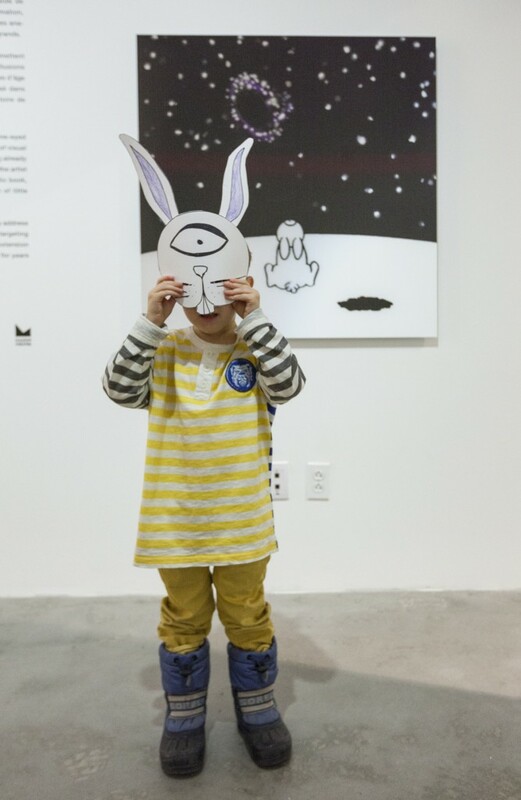 La Fabrique culturelle, « Lapincyclope, le pouvoir de l’imagination », November 27, 2014. 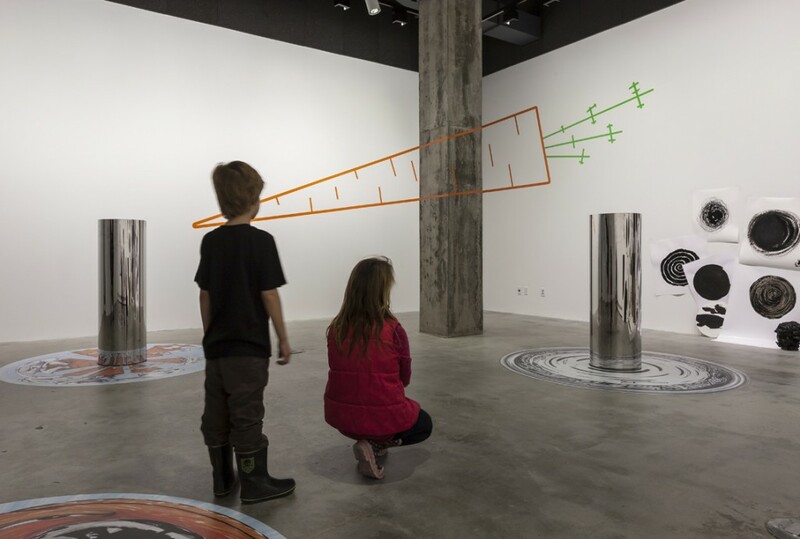 TVA Est-du-Québec, « Lapincyclope au Musée régional de Rimouski », La vie chez nous, December 26, 2014. Regina Haggo, « Imagination is like an extra eye », The Hamilton Spectator, 16 May 2015. 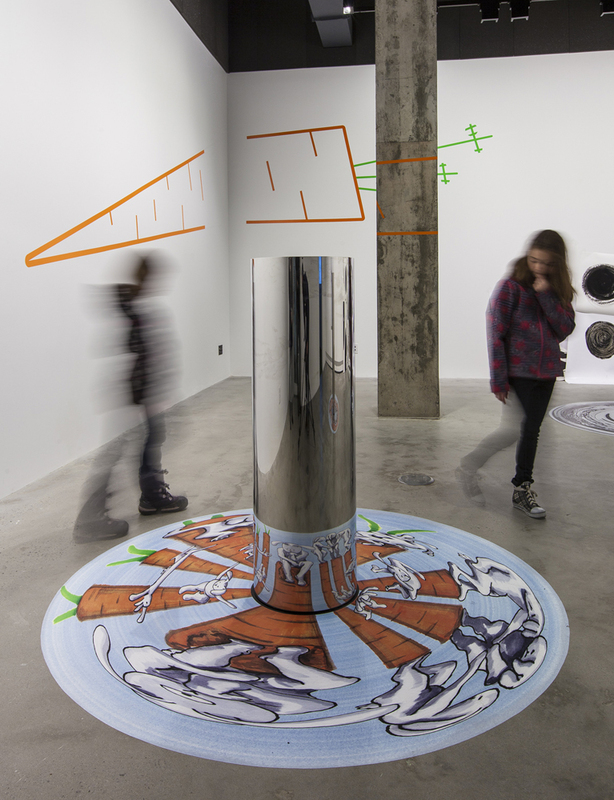 Canadian Art, «Must-Sees» Web section, February 19 to 25, 2015.